Schwinn's New Tailwind eBike – 25 To 30 Miles On A 30 Minute Charge | OhGizmo! 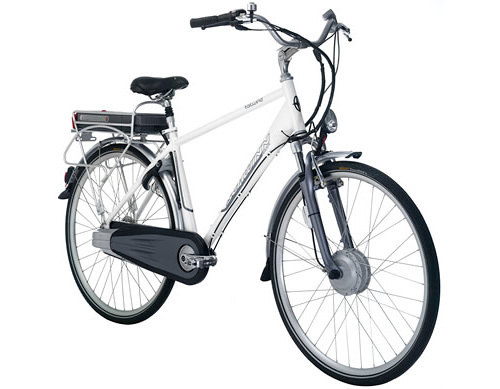 The electric motor is actually housed in the small hub on the front wheel, and the Plug N’ Drive battery pack is located on the rear bike rack making it easy to detach. So instead of having to run an extension cord to where your bike is, you can simply take the battery to the wall outlet. Depending on weather conditions, the wind and your course, the Tailwind is expected to get about 25 to 30 miles on a single charge, but a Shimano Nexus 8-speed internal geared hub allows you to switch over to pedal power should the battery die before you get home. In fact the only downside is the steep $3,199.99 price tag. For that price, I would get a used scooter! Who are these priced for exactly? George Clooney? How do we get commuters on E-Bikes with prices like this? At AmpedBikes we are doing what ever we can to keep prices below $400, we have tested every battery available Li+, Lico2, Limn, Lifepo4 we are having an inframe injection mold manufactured for us and BOY if I could get my hands on these batteries! The bike is completely overpriced and in my opinion they did not do their homework with the US market. The benefits of riding an electric assisted bicycle as a commuter are immense! 1. The average commuter adds 3.55 tons of Co2 to the atmosphere yearly. 2. By riding an electric pedal assisted bike even 4 days a week will reduce the Co2 emissions by 3 tons per person yearly! 3. Your health! You don't even notice it but month after month by commuting you start to actually pedal. You are getting healthy and do not even realize it. 4. Stress.. Your daily stress that only gets compounded in traffic on the way home is melted away by commuting by e-bike, increasing your mental health and daily outlook immensely. 5. Productivity.. If you encourage your employees to commute their productivity is increased by 30% over the first month. There are sooo many reasons to do it and no reasons not to. The battery is just 4.5AH. There is no way that they can get 25 to 30 miles on a single charge. Also the people from Toshiba don;t expect the attery to be ready until April 2009.